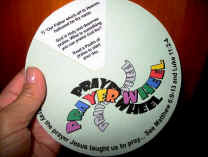 Children turn the wheel and learn how to pray the prayer Jesus taught his followers to pray. Use the Prayer Wheel* during class time, at the dinner table, or for morning and bedtime prayers! Kids color, cut, and assemble the patterns. *Debts and debtors are the terms used in the text. This pattern is also included in our Bible lesson plans, The Prayer of Jesus. Change the quantity to equal the number of extra classes that will use the pattern.